WASHINGTON (CNS) — This is not your parents’ Lent. The Friday no-meat reminder comes through the Lentsanity app produced by the Fellowship of Catholic University Students. 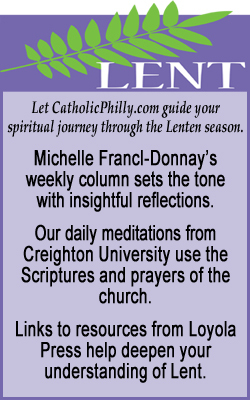 By the third day of Lent, the app — which also offers plenty of Lenten resources – already had more than 10,000 downloads. Jonathan Teixeira and Kevin Cotter, the brains behind the program, work at the group’s headquarters just outside Denver. They told Catholic News Service March 7 that they began working on the project a few months ago. “Lent is a great opportunity for people to get into their faith, to try something for 40 days, and we wanted to provide something for people and how to do it,” said Teixeira. Cotter likened the app’s appeal to the popularity of the pope alarm app they developed last year that sent more than 135,000 notifications after the Sistine Chapel released white smoke indicating that the cardinals had elected a new pope. “People are proud to be Catholic,” Cotter said, and if technology can bring people together around their faith, “it’s even better” because people love to show their friends what’s on their phones, he added. He said the app shows how the church is relevant in the modern world and has something to say, especially during Lent. As he points out, the whole idea of giving something up for Lent is hard in a culture that binge watches television shows and where people eat whatever they want. The idea of online spiritual support is something Christina Mead, web content editor with LifeTeen, also has witnessed. Mead posted a list of creative things to give up during Lent on the LifeTeen blog — which was liked more than 50,000 times on Facebook a week after Lent began. The list includes suggestions such as cutting out screen time, baby-sitting for free on weekends, wearing the same four outfits during Lent and doing ab crunches while praying the Hail Mary. Mead, who spoke to CNS March 12 from LifeTeen offices in Mesa, Ariz., said the whole concept of working together on Lenten sacrifice resonates with teens. And for teens who don’t have a strong parish group they can turn to, she said they can get spiritual support through the online community formed by LifeTeen’s social media outreach. Only one week into the 40 days, Mead said it’s been an exciting time. “I get to see the young church really come alive,” she said. Young adult Catholics also are in the Lent-social media mix. The Paulists’ Busted Halo website features a fast, pray, give daily Lenten calendar. The calendar’s introduction urges those following it — about 30,000 according to Facebook likes March 12 — to think about Lenten practices in a broader context. It suggests fasting from dependence on electronic devices, praying for the 1.6 billion people in the world who have no access to electricity and spending the extra time saved in giving some time to others. But really you don’t have to be young to have fun with Lent or to use one’s phone or computer for spiritual help or direction in the 40 days. Online Lenten tools include virtual Stations of the Cross, apps that track spiritual activities, and tools to help one prepare for confession, pray the rosary or read the Bible.